Hi there. Today I want to share with you this quick and cute card I designed over at the Blue Moon Creation crafting station blog for the current "Use Buttons Challenge". I hope it puts a smile on your face. I have a huge collection of buttons and I just love to use them in my design work. 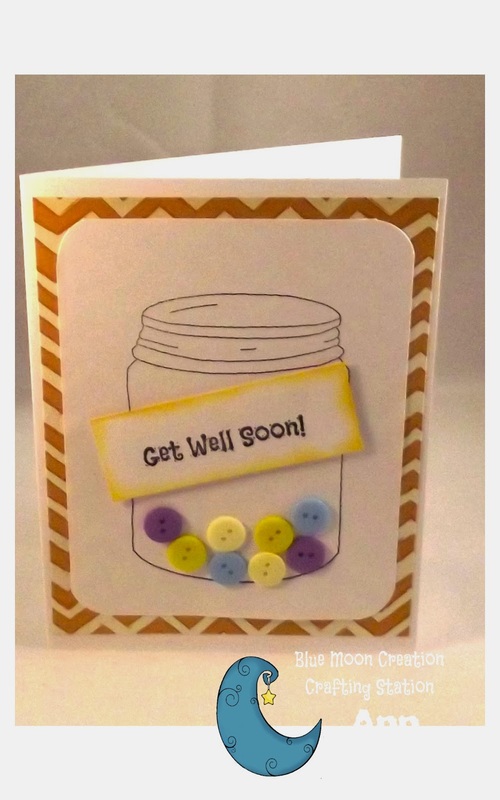 Here I thought they would make for some cute pills in a bottle Get Well card. Plus I think this would at least make an unwell person smile . This was made from an already pre scored white base card (Michael's Recollections), some printed scrapbook paper by American Crafts, and card stock from Staples. I used Ranger's Archival Jet Black ink with the Joyful Jars set of stamps from Blue Moon Creations (Get Inky) available here. The yellow ink is Ranger's Distress Ink in Lemon. The buttons came from my vast collection.